Climate change has been a popular explanation for extinctions from the time that the phenomena of mass extinctions in the geologic record and major climatic fluctuations in the geologic past (such as those during the ice ages of the Pleistocene) were first recognized. Thus, it is an old idea, but the one still favored by our Russian colleagues to account for the extinction of plants at the K-T boundary (see Section 8.5). Climate change would seem to be the default answer for vegetation change, but there is a burden of proof that is lacking. It is not adequate simply to assume that climatic deterioration from the hothouse world of the Cretaceous toward the icehouse world of the Pleistocene can explain the disappearance of plants at the K-T boundary in North America. The abrupt nature of those disappearances as documented in Chapters 6 and 7 make such a facile explanation untenable. As exemplified by changes in vegetation associated with the advance and retreat of continental glaciers during the Pleistocene, floras migrate rather than become extinct. 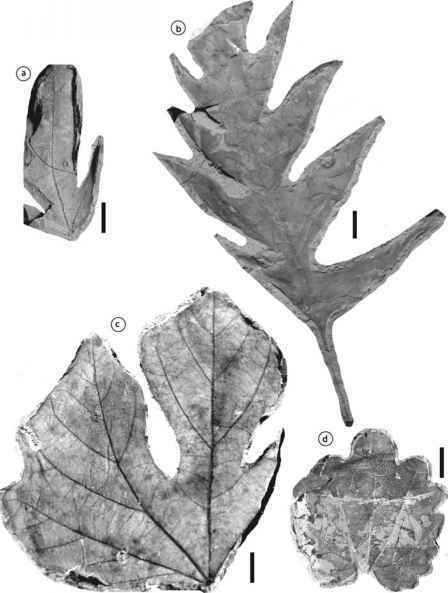 Fossil plants (leaves) contain a climate signal that has been interpreted for the K-T transition (e.g., Wolfe and Upchurch 1987b, Wilf and Johnson 2004); shifts in temperature that affected vegetation provide a background against which the sudden extinctions at the K-T boundary stand in sharp contrast. The essence of the issue is that climate change is gradual, but the extinctions at the K-T boundary, at least in North America, were abrupt. Furthermore, on the global scale there is the correlation between land and sea that ties the terrestrial K-T boundary to the marine record and effectively separates climate change from the impact event (Huber et al. 1995, Wilf et al. 2003).